The witch hazels have something of a cameo role in the garden, but it’s one of those walk-on parts invariably played by a famous actor, admired by all, whose nominally fleeting appearance on the stage is extended by a sustained burst of applause. At first, only those in the know clap, then everyone else joins in, gradually realising they’re in the presence of greatness, and that it will not last. The reason for all this is that the witch hazels, gathered together into the small (but select) genus Hamamelis, do their thing in the garden when we might least expect it and it would be quite easy to go through life without ever witnessing it. Their flowering, in January, happens at a time when many people spend little time in their gardens. Those with inside knowledge, however, quietly anticipate the event with every day that passes after the New Year, so as to be able to savour it when it comes. And it’s no good looking at it from the safety of a window, as the whole point is the scent. Sir Francis Bacon, discussing the perfume of flowers in 1625, favoured planting those shrubs whose flowers scent the air around them beside walks, ‘where it comes and goes, like the warbling of musick’. This is common practice with Osmanthus fragrans in Italy in September, a richly wafting aroma finer than any artificial perfume. Several species of Hamamelis do the same job in the dead of winter. Like all winter-flowering shrubs, such as the ridiculously sweetly scented Lonicera x purpusii, it is common sense to plant them within both view and inhaling distance of a walk to and from a well-used door. The few species of Hamamelis are widely scattered across the Northern Hemisphere. The first one to reach these shores was Hamamelis virginiana, introduced by the great Georgian plantsman Peter Collinson, whose agents in North America included John Bartram and Mark Catesby. Between them, these three were responsible for generating the wave of enthusiasm for plants from the eastern seaboard of what is now the USA that swept through British gardens in the mid 18th century. 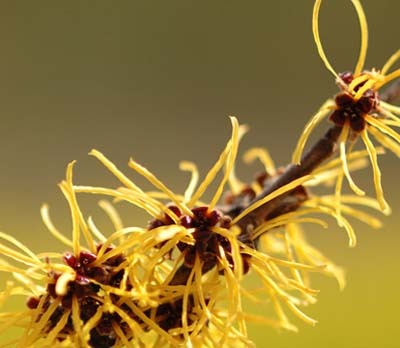 The Virginian witch hazel was already known to be the source of an emollient skin treatment when it arrived here, but its garden merit was also readily appreciated. It’s unusual among witch hazels in flowering in autumn, at the same time as the leaves turn yellow, but shares the general preference throughout the genus for free-draining, acid soils. H. virginiana typically keeps a low profile in British gardens, being mainly used nowadays as the rootstock for grafted cultivars. The real excitement came with the arrival, in the 19th century, of two Oriental species of Hamamelis. H. japonica arrived in 1862, introduced by the German planthunter Philipp Franz von Siebold, who brought us so much of the garden flora of Japan. This has the characteristic flowers of Hamamelis, tufts of yellow in a spidery format, each petal a flattened strip squared off at the end, twisted and crumpled like a Christmas decoration that had been carelessly packed away last year. The scent is noticeable but not exceptional. Hamamelis mollis, however, is something from the big league. It comes from China and was introduced by Charles Maries in 1879. It lay unnoticed in nursery rows until one winter after 1900, when its magnificent display of flowers, in most respects the same as those of its Japanese counterpart but greatly magnified, were finally detected. We can imagine the moment when the nurseryman first stopped in his tracks, wondering where that lovely smell was coming from. The rest is history. Many readers will know and love its famous selection H. mollis var. Pallida, elegantly paler in flower and rich and pervasive in scent. Some witch hazels have an oddly carbolic whiff to their aroma, but everyone should live within sniffing distance of Pallida, one of the great olfactory sensations of the garden, and how much more welcome in the crisp gloom of January. Of course, it could not be long before the boffins thought of pushing a flower of Hamamelis japonica into one of H. mollis and, by the mid 20th century, wonderful hybrids under the umbrella name of Ham-amelis x intermedia were causing excitement in the woodland gardens of many nations. Hybrid vigour was the reasonably predictable result, with the added bonus of a range of flower colour from pale yellow through orange to red. Early sensations emanated from Robert de Belder’s famous arboretum at Kalmthout in Belgium, where a famous new cultivar, Jelena, named after his wife, was produced, with curled, orange-red flowers. While he was at it, he wisely named others after his daughter and granddaughter, giving us Diane and Livia. Others have continued this breeding and selection work to the present day, so that a winter visit to a woodland garden on acid soil in January is a special treat for the eye and the nose. Much development has gone into broadening the available range of flower colours, but without destroying their delicately tufty mystery, so that we can now enjoy such treasures as the inappropriately named but singularly beautiful Amethyst (it’s pink! ), Gingerbread (marvellously twisty filament-like orange-brown petals against the crimson sepals) and the well-named dark-red Rubin. And before we get too carried away with all the thrill of novelty, one early candidate continues, for my money, to carry its lovely head effortlessly above them all. This is Coombe Wood, the name now given to the form of Hamamelis mollis first introduced from the wild in China by Charles Maries in 1879. Its pale, memorably scented flowers bear comparison with any of the wonders bred since, all of which look sensational in an identity parade. Take your pick.